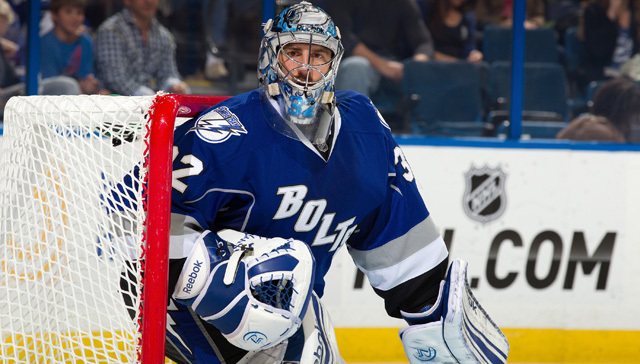 The expectation for Tampa Bay Lightning head coach Guy Boucher may be to ease goaltender Mathieu Garon back into the lineup once the puck drops on the 2012-13 regular season. Not if Garon himself has anything to say about it. Skating in Brandon last week, Garon said that he feels great and that he is ready to start the season, despite coming off of a season-ending groin injury. The news comes as refreshing not only to Garon, but to the entire Lightning team, as he was in large part responsible for helping the Bolts make a strong late-season push towards the playoffs last spring until a torn groin muscle sustained on Mar. 6 sidelined him for the remaining 16 games of the season. With that, it has been six months since Garon last saw any NHL action, however he looked sharp in his skating abilities and reported that there have been no setbacks during the recovery process. "It's not awkward at all getting back on the ice," Garon said. "I've been working all summer to strengthen the muscle. I would say right now it's 100 percent." For Garon, the injury was nothing new. He revealed he endured a similar injury "six or seven years ago" that helped him cope this time around. "I think back then when it happened for the first time, you feel like you want to get back on the ice the next day, but you know it's impossible," he added. "Now I know that it takes time, but even still every week I was always hoping for news of a quick comeback." A comeback, actually, is exactly what is in order as Garon looks ahead to the new season and splitting time with new Bolts net minder Anders Lindback. Adding to the excitement, he said, was realizing the potential of this year's team, which collectively, will return at a full bill of health to start the season after a large number of injuries hindered the club's performance in 2011-12. "Right now everything is looking good," Garon said. "With the new additions, I feel like we're all ready to prove that last year was just a fluke. It's good to see also that everyone is coming back healthy."